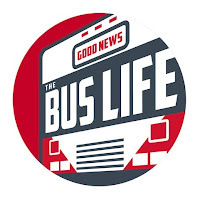 Just an update to say hi and let you know what's happening in our converted school bus, the Good News Bus. This is BUS LIFE! Ahhhh...the life of a family. The same whether in a bus or in a bricks and sticks house. Seems hectic but one day it will all be so quite and these times will be missed. I have a feeling though, that as your kids grow older, then the grand kids will start coming around to keep the noise level almost as high as it now. Savor these days even as patience and energy runs low for, that is what makes a family what it is. Love to all of you.